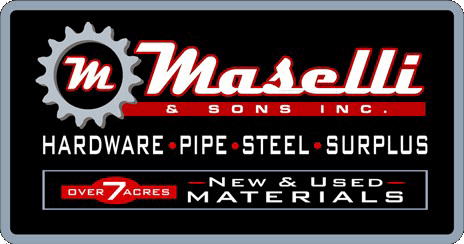 Metal Design - M. Maselli & Sons, Inc.
We have the ability to create custom-cut gate designs, address signs, ranch signs, logos, name plaques, garden art and much, much more on our Plasma Cam machine! We can cut any basic shape in up to 3/8" thick metal, or any intricate design in 18 gauge - 1/4" thick metal. Contact us today to get started on creating a custom metal project of your own - or have Luke design one for you! Custom plasma cut steel letters for barn door track gate. We also sell all hardware necessary for creating barn door track creations like this! We can plasma cut any basic shape in up to 3/8" thick metal, or any intricate design in 18 gauge - 1/4" thick metal. Contact Luke today to get started on your custom plasma design! No place like home, Bay area inspired, plasma cut steel decor sign. Logo or custom signt into up to you 3/8" thick metal! We can cut nearly any design in up to 3/8' thick metal. We also have welding and drilling capabilities! Custom cut steel logo signs for local Petaluma business, Rust & Shine. Custom plasma cut steel sign for Bales Orthodontics. We can custom plasma cut any business logo or design in up to 3/8" thick metal! Custom plasma cut steel sign for the new Petaluman Hotel. A Family Owned and Operated Business Since 1960.